Database servers store massive amounts of data, often including sensitive information. It is not uncommon for there to be databases holding millions of rows of data, where a small subset of rows are considered critical or sensitive. This could be anything from a Social Security number to an EventSentry entry of a security event. Being notified when existing data in your database changes is crucial for log data, and can be accomplished by using triggers with Microsoft SQL Server. For those of you not familiar with triggers, a database trigger executes code in response to events on a table or database. Triggers are essentially hooks into a table, and they usually execute SQL statements as a response to another SQL statement. Since we love the windows event log, we’ll take advantage of SQL Server’s ability for triggers to log an event to the event log when a row in a table is modified. This allows us to not only log that activity, but also get notified immediately when suspicious or important activity occurs in the EventSentry database. In EventSentry, we have a table named ESEventlogMain that stores Windows event information. This table constantly gets new data inserted into it, and it often gets purged as well to manage the size of the database. However, there is no reason this data should ever be modified. If it is, then we know that something is amiss and we want to trigger an event in the event log. It is also useful to know what account made that change. The first argument is a unique SQL server message ID that should be 50001 or higher, you can delete it again using sp_dropmessage. The number 10 is the severity level, but you can read more about the different options for sp_addmessage here. 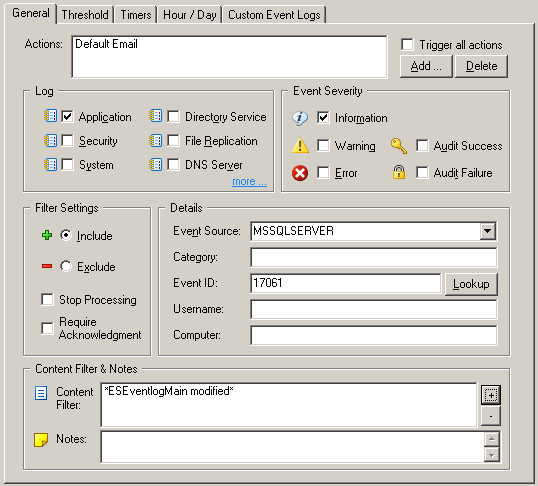 This creates a trigger which will generate an event when the eventmessage column in the ESEventlogMain table is modified. You can remove the “IF UPDATE(eventmessage) …” clause (as well as the BEGIN & END statements) if you want to be notified of any changes to that table, this might however create some noise since acknowledging events will also perform an UPDATE on this table. record that was updated (=deleted) or the new data (=inserted). Events generated from triggers always have the event id 17061, so it’s a good idea to restrict the filter further using the “Content Filter” field. From now on, when the ESEventlogMain table is modified, we will get an entry in the event log as well as an email. Just remember that any database administrator can delete or modify triggers, so it’s crucial that you keep dba access to your database as restricted as possible. Please see the Table Relationships topic in the EventSentry help file for more information on the database tables used by EventSentry.